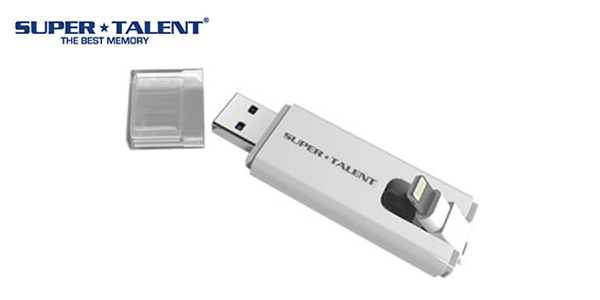 If you are an iPhone or iPad user and uses a Windows PC, there’s a 2-in-1 flash drive that Super Talent offers. The Super Talent TwoDrive Flash Drive with Lightning and USB 3.0 connectors is what you are looking for. The Super Talent TwoDrive is a high-speed flash drive with a USB-A 3.0 connector for Windows PC and Lightning connector for iOS devices making it easy to transfer data in between devices. The TwoDrive works by using the free STT Mobile Manager app found at the Apple App Store. The TwoDrive uses a rotational design for the Lightning connector so it can be hidden when not in use. With the TwoDrive, iOS users can now easily offload files from their iPad or iPhone offline to save space. Also, iOS users can play audio and video files directly from the TwoDrive flash drive. - For use with Lightning and USB 3.0 connectors. - Lightning and USB 3.0 Super Speed connections for fast data transfer. - Designed with a rotational connector allows users to easily swing the Lightning plug while the plug is in use. The Super Talent TwoDrive is available in four capacities: 16GB, 32GB, 64GB and 128GB. For more information on the TwoDrive Flash Drive with USB 3.0 and Lightning connectors, visit the Super Talent website.